Michael P. Pell II, Tracy O’Hara, and Rachel D. Cummings (l-r) are sworn in as appointees to the Southern State Community College Board of Trustees. Ohio Gov. John R. Kasich’s office has announced two new appointments and one reappointment to the Southern State Community College Board of Trustees for terms continuing through May 11, 2024. Rachel D. Cummings of Adams County and Tracy O’Hara of Brown County have been newly appointed, and Michael P. Pell II of Adams County has been reappointed, as representatives of their respective counties. The latest appointments fill the remaining open positions on the college’s board. Also serving as SSCC trustees are Brian Prickett and Kyle Rudduck representing Clinton County, Doug Boedeker and Chair Brian de Bruin representing Fayette County, and Lynn Stevens and Kristy Wilkins representing Highland County. Rachel Cummings is a registered nurse at Adams County Regional Medical Center where she serves as Chief Nursing Officer (CNO), PI Coordinator, Infection Control Practitioner, and Clinical IT Educator. She volunteers her expertise as a member of Southern State’s nursing advisory committee. Tracy O’Hara is a real estate agent with Realty Executives Showcase, and a multi-unit leader and secretary with Mt. Orab Investment Group which owns and operates LaRosa’s and Dunkin’ Donuts/Baskin Robbins in Mt. Orab. She also works as secretary for Pitsa Inc. which own the LaRosa’s currently being built in Hillsboro. From 2014-17, she served as a school board member for the Western Brown Local School District. Mike Pell has worked in the banking industry since 1983, most recently as president and CEO of First State Bank in Winchester. Pell is a member of the Ohio Bankers League and Leadership Adams, and serves on several boards, including First State Bancorp, Ohio Bankers League, Hospice of Hope, and Leadership Adams. Additionally, Pell serves as an elder at the Winchester Church of Christ in Christian Union. He was first appointed to the SSCC Board of Trustees in 2012 and has served as board chair. Chosen by Ohio’s governors, the nine trustees who comprise the SSCC Board of Trustees establish policy; select, hire and evaluate the president; review and act on financial matters; and establish schedules of institution-wide fees and tuition. For more information, please visit www.sscc.edu/about-us/board. 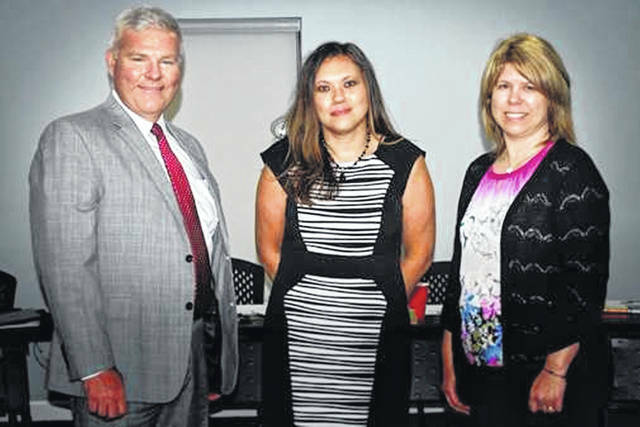 https://www.recordherald.com/wp-content/uploads/sites/27/2018/07/web1_Appointee.jpgMichael P. Pell II, Tracy O’Hara, and Rachel D. Cummings (l-r) are sworn in as appointees to the Southern State Community College Board of Trustees.